The Austrian Minister of Finance Maria Fekter is happy with the „Pro-European „ statement oft he Greeks. Minor adjustments to aid packages would be possible. 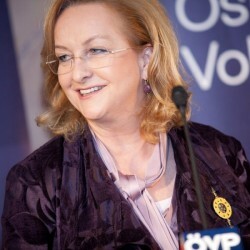 “We are relieved to note that there is a majority in Greece that is pro-European”, Austrian Finance Minister Maria Fekter stated in comments on the outcome of the elections in Greece, in which the conservative New Democracy (ND) party emerged as the winner. However, it makes little sense, Fekter stated, to revise the overall Greek aid package. “It serves no purpose for us to call everything into question at this point and start over from zero”, Dr Fekter said. She said that the EU will have to proceed on a step-by-step basis and see how best to proceed within the existing programme, including in respect of the internal situation in Greece. “As soon as Greece has a government again, a troika will be dispatched to Athens to perform an analysis of the actual situation and, depending on the outcome of the analysis, determine where we need to act, where we need to intensify efforts and how we could potentially improve the situation”, the Minister explained. This monitoring, she explained, is a part of the current programme. “The entire package is professional and well-balanced. I see absolutely no cause for critics to come forward every two months or so to call it into question”, Fekter went on to say. In addition, she noted an abandonment of the package would contradict the charters of the International Monetary Fund (IMF). She pointed out that those charters provide that once an aid programme is commenced it must be fully performed or the IMF will withdraw. She noted that exceptions had been made in respect of the amendments that had been made to the first Greece bailout package. It had taken nine months to achieve this. “It is completely unrealistic to think we could have a complete rethink at this point and adopt a radically different programme”, Fekter emphasised. Now, she said, we will have to await the progress of the coalition talks in Greeks. Fekter was optimistic that “we should know by the end of the week whether a sustainable coalition will come together or not. I hope that the outcome will be a stable government situation and we in the Eurozone will have a new opposite number in Greece with whom we can work to chart the way forward and implement the bailout programme, the aid measures and the technical support.” In closing, she emphasised the fact that the Euro ministers had not, in any event, ever entertained discussions on a potential Greek exit from the Euro. “I am hopeful that we will be able to work together to continue building an economically stable and peaceful Europe”, she stated.